It’s the Guardian top 100 bestselling books of 2012 I’ve got in mind. Maybe I’m wrong to feel pleased there are 23, or 24 if you count The Hobbit, children’s books in the top 100. It’s children from the Hunger Games age group down to the Julia Donaldson age level, with The Wimpy Kid and David Walliams in the middle. 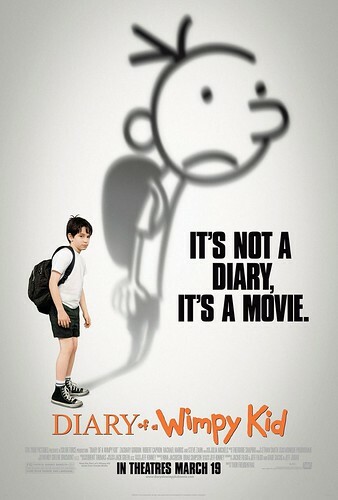 There are rather a lot of Wimpy Kids and David Walliams books on that list, at the expense of more individual fiction. But if the books have been bought, they have most likely been read too, because that’s the kind of books they are. And that has to count as A Good Thing, surely? The Hunger Games film caused hundreds of thousands of books to be bought, and if the Bookwitch Towers experience is anything to go by, they were definitely read, and very quickly, too. Not by me. The film was enough. 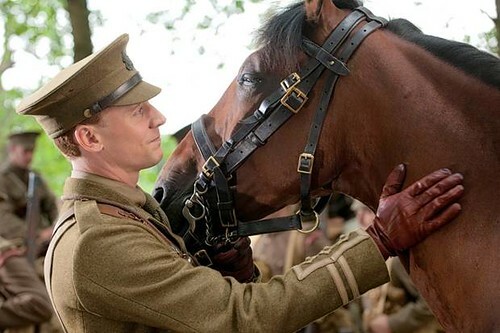 But I recognise that fervour, awakened by a cinema visit. I saw Five On a Treasure Island before reading the books. Almost before I could read, but that didn’t stop me. And look where it got me. 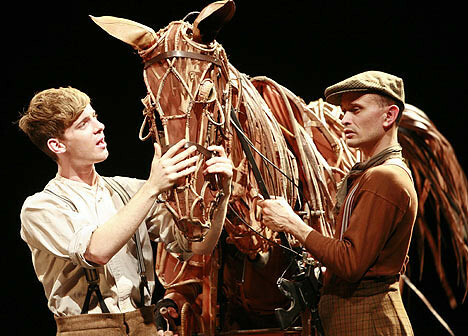 Even theatre can cause book buying, as evidenced by Michael Morpurgo’s War Horse. I would guess the books are bought by adults, but most likely read by children as well. Or was it ‘just’ the film effect again? Whereas I am – reluctantly – conceding that it might be mainly adults who bought and read John Grisham’s latest Theodore Boone, simply because they are Grisham fans. Or possibly because they didn’t realise it’s a children’s book. But what of Terry Pratchett’s Dodger? It comes in the top twenty children’s books in the 100 list, but has not made it into the children’s top twenty. Might that be the adult fan reading everything by their favourite author again? What makes me happy, is that at least a couple of million readers benefitted from the top twenty titles. I hope they will also be reading other books, lower down in the sales league, and that they will continue reading. Always. Grandmothers! We were enjoying tea and Christmas cake (except for me. I had Stollen, on account of sensitivity to all that brandy I had been pouring over the cake since October), and as so often happens, the conversation strayed to Maths and other intellectual topics. When that last happened a few days earlier, Son moved closer to his mother in order to escape the numbers and funny words discussion, in exchange for something suitably light for the two of us. But at this point the Resident IT Consultant entertained his mother – the Grandmother – by showing her the new Brewer’s. She browsed for some minutes before pointing out they’d got Fermat’s Last Theorem wrong. She read it out, with the Resident IT Consultant and Dodo all nice and alert, and Son and me turning our eyes heavenwards. As it happens, she was right. It is wrong. We moved on to secondhand bibles, as you do. The Grandmother works in an Oxfam bookshop, and they get lots of Bibles in, and they sell like hotcakes. She displays all the various kinds of Bibles, and when she returns they have all sold and she has to start over again. Something they also have lots of but which doesn’t sell the way of the Bible, is The Da Vinci Code. It might once have been an Oxfam bestseller, but if she sees one coming, she throws it out. After Fermat, they moved on to Faraday’s complete letters. Someone found a letter where it was mentioned that Mrs Giles would have been very happy to see him. Faraday, that is. The Grandmother was surprised to find the volume she was holding only covered a few years of Faraday’s life (there are six in total), and marvelled at quite how many letters got written back in the olden days. I’m thinking the stamps didn’t cost 50 pence in the 19th century. Following in the footsteps of last week’s failed apocalypse, I can tell you how much I enjoyed Barry Hutchison’s little Christmas prequel to The 13th Horseman. He was asking fans to sign up for his newsletter, by offering a very special Christmas story – to arrive for Christmas – to those who did. 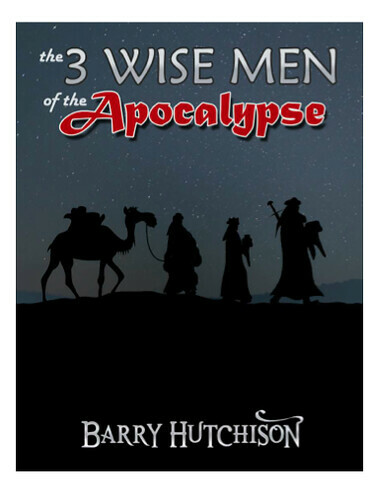 My tears have dried now, and I have read my apocalypse, which is humorous and fun. Perhaps not so much for the camel. But other than that it was amusing. It makes up for the wait for the sequel. Although that is not an encouragement to dawdle over The Book of Doom. 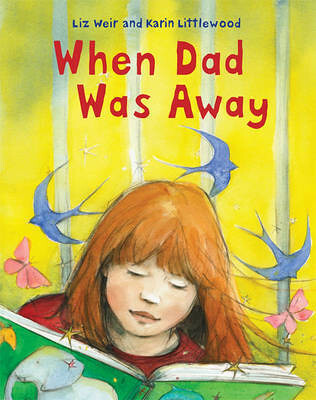 In Liz Weir’s book When Dad Was Away, with illustrations by Karin Littlewood, Milly finds out about her Dad’s fate in the worst way; from the other children at school. But her Mum explains what it means and the family have to get used to their new life. They eventually visit Dad in prison, showing the reader how visitors are searched. Dad records stories on a CD for his children to listen to, so apart from the stealing he is clearly A Good Dad. And they get to go to a Christmas party in the prison. This should reassure children who have members of their family in jail. I only hope the description is an accurate one. In Are the Dinosaurs Dead, Dad? Julie Middleton writes about a very different Dad. This one takes his son Dave to a dinosaur museum. He assures Dave that all dinosaurs are dead. But are they? Well, what do you think? 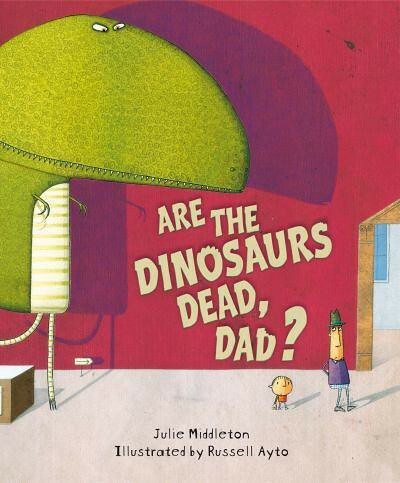 This is a picture book, and its dinosaurs are nowhere near as dead as we’d like them to be. Russell Ayto’s pictures could just about be interpreted as being all in Dave’s mind. That the dinosaurs really are extinct. Except with the last one. Dad and Dave are dangerously close to becoming more dead themselves. OK, people. I am resting. 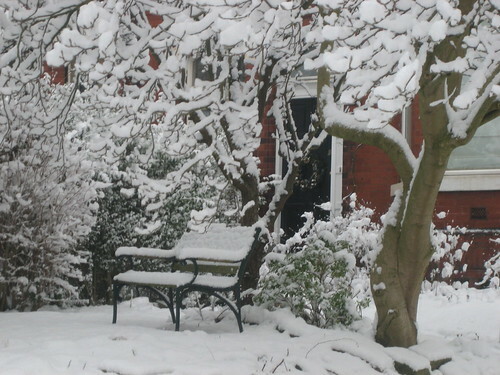 Not in the snow (we don’t have any) and not on this bench (it belongs to the neighbours). But I might have. So that took time. I read. Not much, but I will get through my book before too long. We just need to give up on all this Christmas food. The Resident IT Consultant and the Grandmother are doing jigsaws, and I am letting them. Did a good deed in amongst all this lazing about. The neighbours’ daughter needs to bake a ski lift this week and their electric whisk broke, so I lent them mine. Pardon, the one belonging to the Resident IT Consultant. I married him, as well as his whisk. It’s an antique. Yes, ours is a very small fireplace. Don’t know where I’ll put it, but it looks great and it’s a fine game. 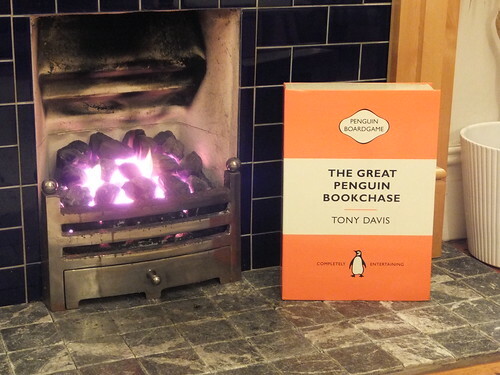 We played it on Christmas Eve, and enjoyed trying to show off how much we know about books. (It’s a Penguin-look book version of Trivial Pursuits.) Obviously I lost. Not as much as Son did, but I do wonder how come the Resident IT Consultant always gets the easiest questions. S’not fair! After the game Daughter spent some happy time sticking fake little book covers on the fake little books. They now look adorable. The idea of winning books and putting them in your little bookcases didn’t work so well, however. Unless full, the books fall out. But you can work round that. And we hardly noticed the Petrograd/Leningrad confusion. Really.